Home / School News / Stuff the Buss!!!!! 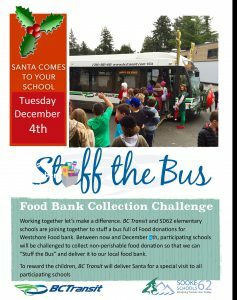 From Monday, Nov. 26th until the morning of Tuesday, Dec. 4th, we will be collecting non-perishable items for the Goldstream Food Bank. 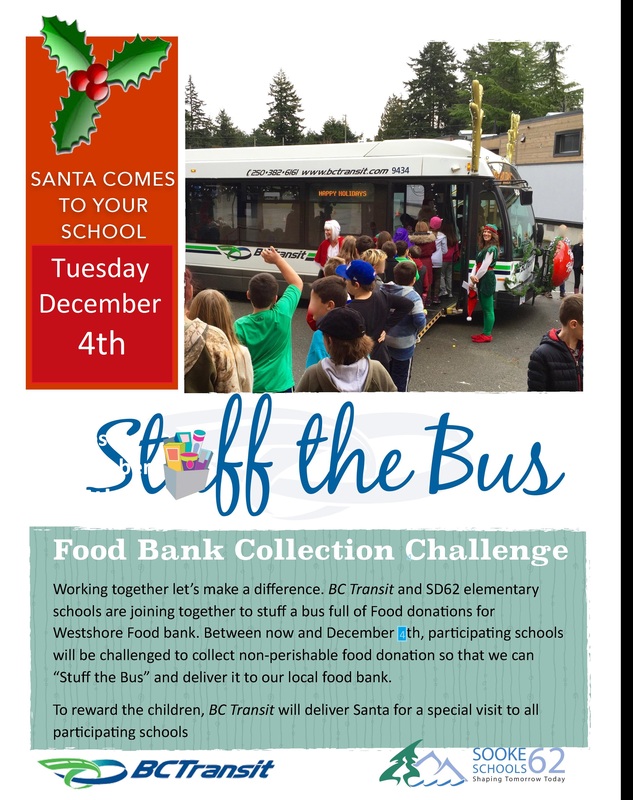 On Tuesday, Dec. 4th, a BC Transit bus, filled with Santa, Mrs. Claus and elves, will arrive in our parking lot and we will stuff it full of wonderful food items for those in our community who are struggling to feed themselves and their families. This is our fourth year being involved in this project, and it is awesome! Sangster families have been very generous in helping us fill up classrooms, the hallway and then the bus! Thank you in advance for your contributions to our community!